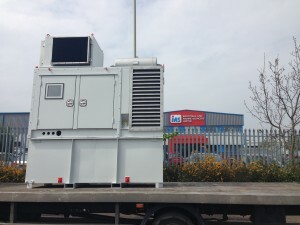 Generators are large, noisy and potentially dangerous machines and so they demand particular care when it comes to their siting and protection. 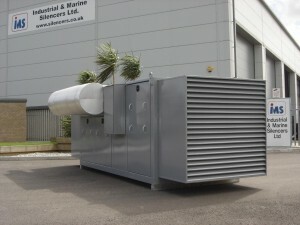 IMS Ltd. build professional generator canopies that protect the machinery and workforce. Protection from the weather can also be provided as well as security, safe access and ventilation. Viewing windows can be built into the doors for visual access to items such as generator control panel. acoustic 50mm resin bonded mineral fibre faced with 1.0mm galvanised perforated steel applied to the doors and roof. 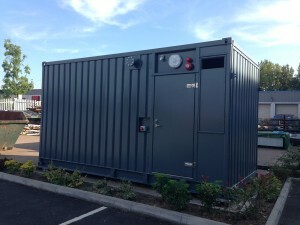 This ensures that the structure meets the noise regulations laid down by the European community. All panels are constructed of non-combustible materials and satisfy Class 1, Spread of Flames requirements.